Christmas comes early in our festive, family fun run! Join the jolliest jog of the year as you dash along Herne Bay seafront with hundreds of fellow Santas in aid of local hospice care. Santas on the Run! is back for its second year and we couldn’t be more excited. Last year saw more than 800 fancy dressed fundraisers take to the streets of Herne Bay and help to raise over £26,000 for Pilgrims Hospices! 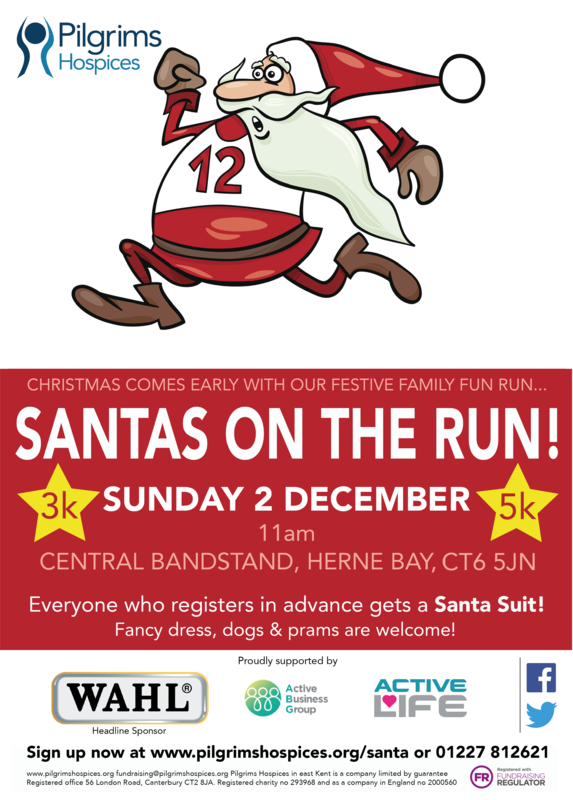 So please, gather your elves, both big and small and join in with Kent’s biggest Santas Run! Entry includes a 5-piece Santa Suit and a newly designed medal. You’ll enjoy music by Herne Bay Concert Band as you prepare for your 3k or 5k route along the seafront and will be welcomed back by a mince pie! Santas on the Run! is an event for everyone. You can walk, run, jump or skip along Herne Bay seafront with your friends, family, colleagues or neighbours. Buggies, wheelchairs and sleighs are all welcome and we would love for you to bring your dressed up doggies along too! Please be aware that we cannot guarantee Santa Suits for those who sign up on the day, so we highly advise that you register in advance to secure your Santa Suit!